With the final issue of Blueprint magazine currently on newsstands, it has finally sunken in that this magazine will no longer be available. In December, Martha Stewart Living Omnimedia announced that it will be shutting down the production of Blueprint after the January/February issue. Although it did not provide a reason, speculation is that it simply wasn’t producing profit and was likely costing the company. Why didn’t it sell? Well, there are a number of reasons that I feel contributed to Blueprint’s demise. It got off to a slow and wobbly start. It only published twice in 2006 and then only bi-monthly in 2007. The sporadic releases were not adequate in today’s saturated shelter magazine market. The magazine struggled to build up a loyal readership because the issues came out so periodically and readers wanted something more definitive, with a more focused vision. The first issue of Blueprint was a mishmash of ideas, mostly good, but the struggle to find a voice was evident. It also struggled to nail down a target market: women between 25 and 40 comprised the official demographic. Blueprint did not, in my mind, adequately understand this demographic. First, I feel the age gap between 25 and 40 is a bit too wide; women barely out of college are not in the same financial or emotional space as women who have been in the workforce for nearly two decades. Many of the articles in the first few issues mentioned husbands and kids and portrayed women living in large homes or elegant lofts. A bit of fanfare and fantasy is fine, but if the reader doesn’t see at least some of herself in the pages, she won’t be coming back. Most women between 25 and 30 that I know are single, childless and living in apartments or condominiums, short on disposable income and not prone to buying $1,500 shoes. As I say, a bit of aspiration and escapism is fine (a magazine about reality would be dolefully depressing) but Blueprint ought to have been more grounded in figuring out exactly what it wanted to espouse. Still, it was a glorious magazine. Its design and layout, photography and style were unmatched on the newsstand in its category. More than alluring, it captured a sense of magic that is so strongly lacking in a lot of glossies these days. Price tags were artfully hidden, even though it did have a rather heavy shopping component. The projects made up for it by being thoughtful and unique, creative and simple. I read Blueprint for those reasons. I’m not a woman, so I was not terribly interested in dresses and shoes and purses and make-up, but I am terribly interested in how those subjects are conveyed through design! I love interiors and new cooking and DIY ideas, especially if they are simple and economical, which Blueprint was always very adept at providing. The last issue of Blueprint, sadly and wonderfully, is the best issue yet. Striking with its red, Scandinavian cover and raven-haired beauty, it sings out to be read. I bought an extra copy, in addition to my subscription issue, simply to be able to cut it up and paste some of the pages and ideas into one of my scrapbooks. The article “Chicago Manual of Style” was gorgeously photographed and was utterly inspiring. The space was small and practical and was full of ideas for anyone’s apartment or home, even if a $5,000 chandelier is a little out of reach. The design elements were gracious and simple, attainable and doable. “A Call to Order” was another sheer stroke of genius, with do-it-yourself design ideas for sprucing up the plain and the boring, all with an aim to organize in a fun and unique way: no plastic bins and wicker baskets here, folks. The one thing I’ll miss most about Blueprint is the column “100 Reasons To.” I loved it from the first issue onward. I read it and scrutinize it, saving the links to online shops and websites I’m curious about and taking some of the advice to heart. 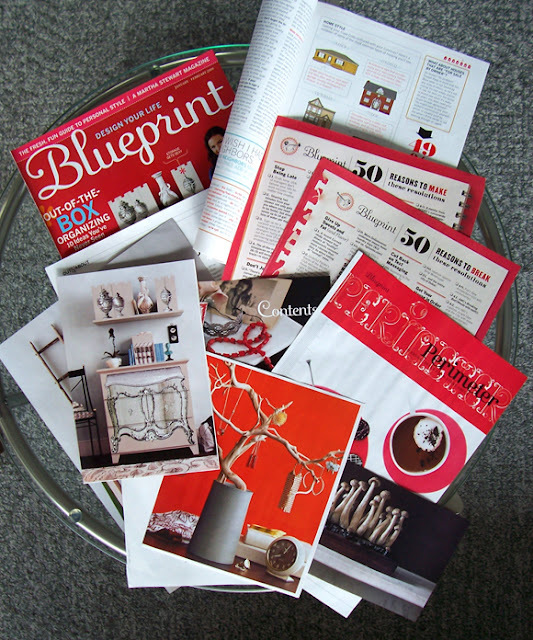 Martha Stewart Living has said that it is working hard to incorporate Blueprint content (and some of its former staff!) into its other platforms. 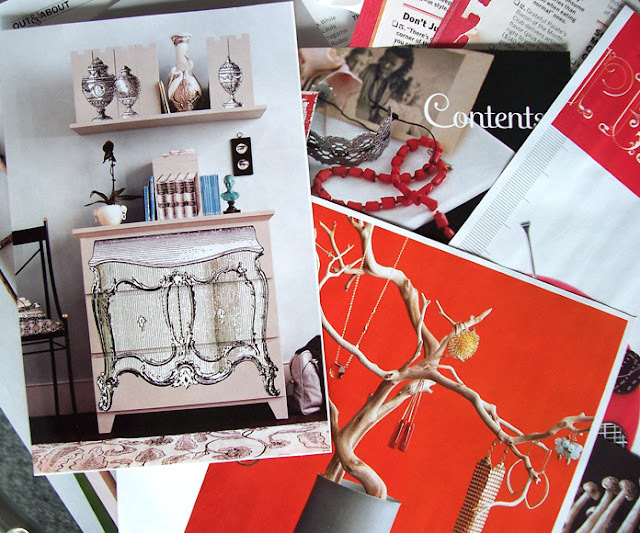 An initial idea to fold the magazine content into the Weddings magazine was blown out of the water by Blueprint readers who reacted very strongly against this idea. 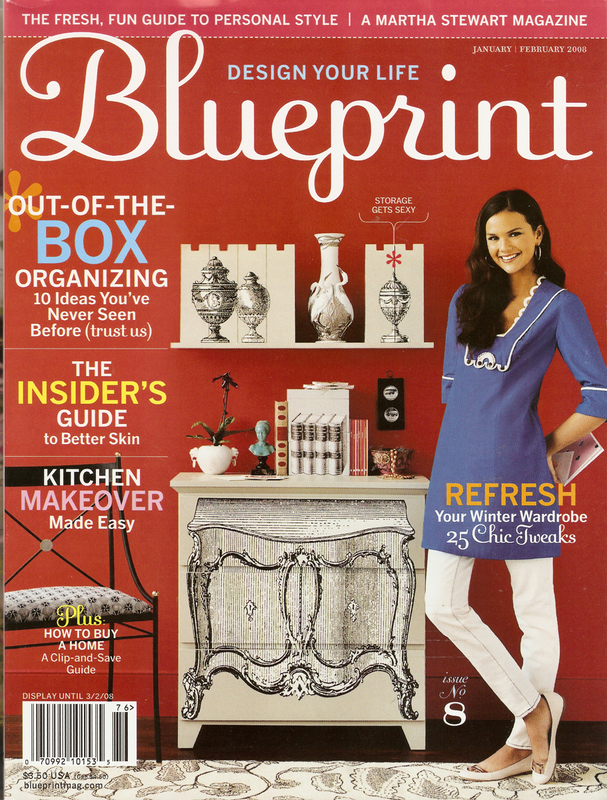 In my mind, Blueprint was very much a single woman’s magazine, even though it pretended not to be. Thankfully, the editors capitulated and have said that they will maintain the online substance of Blueprint (the website and the blog) and may periodically release special issues on newsstands. Whatever they choose to do, I will miss my bimonthly guide to ‘fresh, fun, personal style.’ But I’ll go about designing my life all the same.